Normal VGA (Video Graphic Array) is a very high quality analog standard for the connection between a computer and a monitor. VGA cables are commonly used on computer monitors, LCD screens, plasma displays, desktop & Notebook computers & projectors. 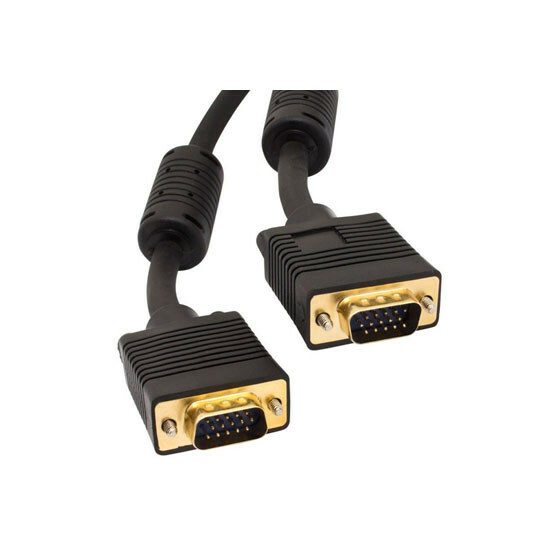 VGA cables offer the highest image quality outside that of digital links. Now SVGA (Super Video Graphic Array) is a standard even more superior to VGA. SVGA cables are constructed with higher quality materials and higher specifications than VGA cables. They are better in delivering dependable video transmissions and work better in longer distance transmissions. They are ideal for video splitting, KVM switches and source to display video links in 'noisy' environments. These SVGA cables have superior shielding to help eliminate interference and signal degradation. They also come with double ferrite cores, one on each end, to provide optimal EMI and RFI screening protection. Some monitors of certain top brands require full pin configuration for maximum resolution delivery. Our range of SVGA cables has full 15 pin connections. They also have Ferrite cores for optimal EMI and RFI screening protection.